2018 Buick Enclave Pros and Cons: Why (Not) This Car? Buick, on the verge of extinction, first began regaining traction in North America with the 2008 Enclave. An extra-large, cushy, quiet, and stylish three-row crossover with more interior space for people and their stuff than any other, the Enclave sold well (especially for a 21st-century Buick). Yet Buick continues to struggle to attain a semi-premium status. While positioned between Chevrolet and Cadillac, Buick is generally perceived by the car-buying public as much closer to the former than the latter. It's rarely considered a direct competitor to even marginally premium makes like Acura and Volvo. For 2018, Buick fully redesigned the Enclave for the first time since the model's introduction a decade earlier. In its lattest attempt to change public perceptions and move upmarket, the brand offered the redesigned crossover in a more luxuriously appointed Avenir trim. This trim level, also available on the Lacrosse large sedan, takes its name from an enthusiastically received but never produced concept car. This saddle color is only offered on the Avenir. Sporty console with clunky shifter. Why the 2018 Buick Enclave? According to the official specs, the Enclave's maximum cargo volume decreased dramatically with the redesign, from 115 cubic feet to 98. In reality, though, you can stuff about ten percent more stuff into the new Enclave. How can this be? Well, Buick parent General Motors switched to a more conservative method of measuring cargo volume. With many three-row crossovers you have to choose: do you want to transport six-plus people OR do you want to carry their stuff. Because these crossovers have little space behind their third-row seats, these seats must be folded to carry more than a couple of medium-sized bags. This was pretty much the case even with the first-generation Enclave, as large as it was. It could carry more cargo behind its third row than most other crossovers, but this wasn't saying a lot. There still was not enough space for a five-person family's luggage. Ford's large crossovers enjoyed an advantage here, as they had a minivan-style deep well behind their third-row seats that made it possible to carry a couple of large bags plus a few smaller ones back there. With its redesign, the Enclave gained such a well, and it's a generous nine inches deep. Unike those in the Fords, the Buick's well is covered and the floor section covering it is hinged and not removable without tools. But if you want to extend the cargo space vertically into the well this floor section can be folded up against the third-row seat back (just make sure you don't damage the then-exposed latch). One nit: if the Enclave's second-row seat is all the way back it obstructs the third-row seat from folding. This renders the point of the Avenir's power-folding third-row seats moot, as you must walk around to each rear side door and manually move the second-row seats forward before the third row can fold. Thanks to its boxy shape and efficient packaging, the Volvo XC90 can carry more cargo than most crossovers its size. But with ten fewer inches of overall length to work with, Volvo's engineers could only do so much, and the Enclave enjoys a clearly visible advantage in cargo space. How large of an advantage. It's hard to say. Officially, the XC90 can swallow 86 cubic feet of cargo. But was this figure calculated using a liberal method or a conservative method? Either way, if you want the crossover with the most cargo capacity, the Buick Enclave (or the related Chevrolet Traverse) is it. Despite its size, the original Buick Enclave had a tighter, less comfortable second-row seat than many smaller crossovers. With the redesign this has been fixed. Second-row legroom has increased by a substantial three inches and--of at least equal significance--the seat cushions have been raised higher off the floor. Adults sitting in the second-row seats now enjoy a modicum of thigh support. But if you want to fit three people in the Enclave's second row, you can't. All Enclaves are fitted with captain's chairs. For an eight-passenger large crossover, check out the related Chevrolet Traverse. The Enclave's third-row seat isn't as roomy or as comfortable as its second-row seats, with both knee room and head room in shorter supply (the latter thanks to a bulge in the rearmost section of the headlinder). But if the second row is moved forward a couple of inches (also necessary for folding the third-row seat) then both rows offer plenty of legroom. It helps that there's plenty of space for toes beneath the second-row seats. Plus there's enough shoulder room for three people in the way-back, one more than in most three-row crossovers. Occupants of both the second and the third rows enjoy an open view forward thanks to stadium-style seating. Volvo's reputation for comfortable seats is based on the comfort of its cars' front seats. The Volvo's second-row seats are comfortably high off the floor, but they aren't as roomy as the those in the larger Buick. It's third-row seat is considerably tighter than that in the Buick, and can only hold two (optimally prepubescent) people. Artful "sweep spears" high on the fenders are a classic Buick cue that work well here. Buick has made quietness a key brand promise for more than a decade, and the new Enclave is even quieter than the original inside. After a long drive you'll still feel relaxed. We took a day trip to the other side of Michigan and back to test this. (And to explore Art Prize in Grand Rapids. Held every other year in September, it's well worth seeing.) The Enclave is a very good vehicle for traveling. The Volvo is also quiet inside, but noise isn't hushed as thoroughly as in the Buick. By fielding multiple brands, General Motors can potentially style its cars more distinctively, as they don't each have to try to appeal to everyone. It realized this potential with the large crossovers. While Chevrolet's designers gave the Traverse squared-off forms and edges so it would more closely resemble the truck-based Suburban, the Buick Enclave is all curves. Some of these curves are more apparent than real. The eye has been tricked. In reality, the Enclave's rear end is nearly as squared-off as the Traverse's, and this is reflected in cargo volume and third-row headroom stats that trail by mere tenths (of cubic feet and inches, respectively). I personally prefer the Enclave's more organic look. And yet, I'm sure some people will prefer the Buick's styling to the Volvo's. While the new Cadillac and XC90 share an aesthetic, and thus can be compared on a somewhat objective basis, the Enclave is an orange to their apples. Evaluated against its own yardstick, the Enclave's styling probably comes about as close to perfection as the XC90's. There's a lot going on, but all of the lines and curves meld to form a coherent whole with a clear theme. Very well done. The Buick Enclave offers pretty much anything someone might expect in a $60,000 large crossover, including a full array of safety tech. Plus something not yet expected: a high-res rearview camera display in the mirror. The pillars that obstruct a conventional rearview mirror--gone. Plus, for parking, an around-view camera system is available. This feature is especially welcome in vehicles that occupy as much of a parking space as the 204-inch-ling, 79-inch-wide Enclave does. Why Not the 2018 Buick Enclave? Now for the not-so-good. But, to be fair, all of my complaints are of the "very good when it could have been oustanding" sort. Each time General Motors redesigns a car, it strives to improve its interior materials. Yet, while the new Enclave does have a much nicer interior than the original Enclave did, even in Avenir trim it still has a way to go before it seems as upscale as the Volvo's. I should also note, though, that according to Car and Driver the XC90 has an interior worthy of a vehicle twice its price. So the yardstick I'm using here is lofty. And that noted, a couple of the Enclave's interior bits could especially use more refinement. The shifter creaks when you grab it, and generally feels cheap and clunky. (One of the newfangled monostratic shifters that returns joystick-like to center after each operation, this new GM shifter is also confusing to use.) The sunroof shades require a very firm push upwards before they'll release. The second-row shade also requires far too much effort to pull it forward. Overall, though, a very nice interior. Just not outstanding. Similarly, while the Buick Enclave's front seats are comfortable, they're marginal for those in a nearly $60,000 vehicle. The Volvo XC90's front seats are available with a much larger number of adjustments and even without these look and feel much more posh than the Buick's. Some people might also find the Enclave's tall center console overly intrusive. I personally like the sporty vibe it brings to an otherwise unsporty vehicle. In general I like what Buick's designers tried to do inside the Enclave, with clean, flowing lines and a low-profile Audi-like instrument panel. There's just something missing in the execution--it's about 95 percent of the way there--and I can't quite put my finger on what the missing 5 percent is. It's in the details. Large but not disproportionate grille. Artful flowing lines. The new Enclave has roomier and much more comfortably positioned second-row seats than the original. Weight reduction was among the primary goals of the Buick Enclave's redesign, and here GM's engineers enjoyed much success. Curb weight has been reduced by about 400 pounds. Though the Enclave is nearly ten inches longer than the XC90, it weighs slightly less than the Volvo. Meanwhile, the Enclave's V6 engine has gained 22 horsepower (for a total of 310) and the automatic transmission has gained three ratios (for a total of nine). Combine these powertrain upgrades with the curb weight reduction and the new Enclave is quicker than the old one and about as quick as 99.9 percent of three-row crossover buyers will ever want their vehicle to be. On paper the Volvo XC90 has a few more horsepower, but these are extracted via both supercharging and turbocharging from a 2.0-liter four-cylinder engine that makes four-cylinder engine noises, so acceleration in the Volvo doesn't feel as smooth or as effortless. 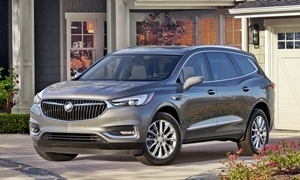 The Enclave's curb weight reduction and additional gear ratios bump the Buick's EPA ratings from 15 mpg city and 22 mpg highway to 17 and 25, respectively. But the Volvo is even more efficient with ratings of 20 mpg city and 27 mpg highway. In my real-world driving I could coax the Enclave's trip odometer to 25 mpg both in the suburbs and on the highway. The re-engineered Buick Enclave felt softer than I'd personally prefer in casual driving, with overly light steering at sub-highway speeds, but took a firm, precise line when pressed (and when tighter handling was actually needed). So the chassis performs well technically, and makes the Enclave very easy to drive for such a large vehicle. But it delivers no thrills. The tested vehicle was a 2018 Avenir with the Technology and Trailiering Packages. The former included adaptive dampers and a button to manually specify a sport mode. The latter replaced the sport mode button with a tow mode button. At least this appears to be the case. After the Enclave had gone back I learned that using the button to engage tow mode also would have engaged sport mode, and possibly delivered the tighter steering and suspension damping I often wished for during my week with the car. To think it might have been just a button push away the whole time! The button in the 2019s has been redesigned (and hopefully more clearly labeled) to serve both functions, toggling among the different modes. The Volvo's chassis delivers, if anything, fewer thrills. Also, the XC90's handling feels less polished and less precisely controlled controlled than the Buick's despite the vehicle's tidier dimensions. The Buick Enclave rides much more smoothly than the Volvo XC90, which can feel overly firm even with its optional air suspension set to "comfort." And yet all is not perfect with the Buick's ride. Perhaps due to all of the effort that went into weight reduction, from time to time I detected tremors within the Enclave's body structure over bumps. Pricing for the Buick Enclave starts around $41,000 for the 1SV (Preferred for 2019) trim that's not available with AWD and that is likely hard to find on dealer lots. Pricing for the Buick Enclave really starts around $45,000 for the more common Essence trim level. Specify the top-trim Buick Enclave, add all-wheel-drive and the Technology Package, and the bottom line approaches $60,000. Though the Buick's interior doesn't quite achieve a premium ambiance even in Avenir trim, the Enclave can have a premium price. A similarly loaded up Volvo XC90 T6 Inscription costs just a couple thousand more. Step down to the T6 Momentum with nearly as many features, and the Volvo costs $2,000 less than the Buick ($3,000 less if you don't need 20-inch wheels on your family-hauler). Given that the Enclave isn't a huge step up from the Traverse, some people might wonder how much more the Buick costs than the Chevrolet. Well, load them both up and the Enclave Avenir costs $6,440 more than the Traverse High Country. The Buick does have about $1,700 worth of features you cannot get on the Chevrolet, including the adaptive dampers, a reconfigurable instrument cluster, forward obstacle detection, and real wood interior trim. But even after adjusting for these features the Buick costs nearly $5,000 more. It might be said that large three-row crossovers aren't about emotional needs, but about getting people and their things where they need to go comfortably and safely. This the second-generation Buick Enclave does, and does well, with more interior space than any other crossover (save the related Chevrolet), a smooth, quiet ride, and all of the latest safety features. Plus it looks stylish and drives pleasantly. It's a very good car. Yet I can't shake the feeling that, with just a little extra here and there, the Enclave could also deliver a truly special experience. This would also help the Buick brand achieve the semi-premium market perception it has long sought, but even with the latest upgrades and improvements hasn't quite achieved. This is where the Volvo has an edge. Not that the XC90 drives particularly well. It doesn't, with powertrain and chassis dynamics inferior to the Enclave's. But the Swede's styling and interior appointments excite in ways the Buick's do not. There's something special about it even if the engineering doesn't match up. Which, then, is the better vehicle for you? It depends on how much you need the Buick's extra space and how entranced you are by the Volvo's aesthetic charms. If the latter don't do much for you--and this is certainly a subjective area--then the Buick leads in nearly every other way. A 310-horsepower V6 is all 99.9% of large crossover owners will ever need. Quick and decent mpg. As much cargo space as you can get in a crossover (except slightly roomier because squarer Chevy). Buick and Volvo each provided an insured car for a week with a tank of gas. 2018 Buick Enclave pros and cons, according to Michael Karesh: the best reasons for buying (or not buying) the 2018 Buick Enclave. Join TrueDelta to post your own impressions.